The short interest in solar stocks has set up investors for a short squeeze if the fourth quarter is as good as anticipated. There's a deep-rooted pessimism in the market against solar companies. Maybe it's the after-effect of Solyndra or a belief that solar power is only competitive with the help of government subsidies and handouts. There was a time when many of those beliefs were true, but today the solar industry is competing with the grid on economics, not subsidies. The solar feed-in tariff rate in Germany is lower than the cost of power from the grid, SunPower (NASDAQ:SPWR) recently began construction on a utility scale project in Chile that will sell power in the spot market, and First Solar (NASDAQ:FSLR) is building utility scale projects in the U.S. and selling power for nearly half the retail price of electricity. When you consider that it's only becoming cheaper to build solar projects and demand will rise exponentially as costs fall, investors shorting solar stocks are playing a dangerous game. Fight the facts all you want, if my predictions are right and solar companies post impressive profit numbers for the fourth quarter these stocks could skyrocket. Some of that fuel will come from short sellers themselves. When you short a stock, you're borrowing it from your broker and selling it to someone else with the promise to return the share to your broker in the future. If the share price goes up, you lose money and eventually your broker will limit the losses they're willing to take on the share you borrowed. That's what's called a short squeeze. When a share's price starts to rise, short sellers or their brokers panic and buy back shares, increasing the number of buyers in the market. The most famous short squeeze in the past year was Telsa Motors, who was propelled from around $30 per share a year ago to more than $100 in a short time because of short sellers buying in bulk. Short interest becomes a problem when everyone wants to close their short positions at the same time. If the percentage of shares outstanding sold short is too high, the short squeeze is more likely. 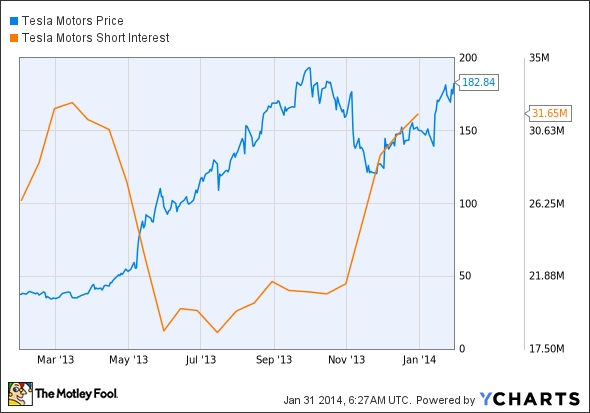 What's interesting in solar is that short interest has gotten out of control. Below, I have a table of the percentage of shares on the market sold short and the number of days the days to cover, or number of shares short divided by average daily volume. Source: Nasdaq and SEC filings. What's most notable is that 31.7% of SunPower's shares are sold short. This pulls out the 66% of the company Total owns and aren't going to be bought or sold in the open market anytime soon. That's even higher than Tesla's short interest when it went on a hot streak. First Solar, SolarCity, Yingli, and Trina Solar aren't all that far behind at around 10% of shares sold short. What should be worrisome for shorts is that financial conditions for solar companies are only getting better and Q4 may be a blowout. China reportedly installed as much as 12 GW of solar in 2013 and up to 8 GW of that may have come in the fourth quarter. If the reports are true, Yingli and Trina will have seen a tremendous amount of demand and likely raised prices as well. Financials may have improved so much that both companies could make a profit for the fourth quarter and project a profit in 2014. First Solar and SunPower are already profitable and if they surprise investors with higher margins in Q4, these stocks could shoot higher. Then there's SolarCity, which continues to wow investors with the speed it can grow installations in the residential market. Top-end solar companies have been outperforming expectations during 2013 and, with the momentum building in Q4, we could be in for a short squeeze when earnings come out. I certainly wouldn't want to be betting against solar right now.